Genesis Contra Hard Corps. Condition is Very Good. And works great I will give a full refund if your not happy Shipped with USPS First Class Package. Item is authentic new & factory sealed -. 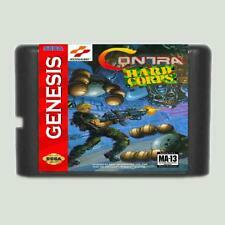 Contra Hard Corps Genesis NEW SEALED. Condition is Brand New. Shipped with USPS First Class Package. US NTSC GENESIS model 1 & NTSC VISIO TV. 1 Art Work Cover Insert (Original). 1 Plastic Clam Shell Box (Original). Up for sale is one reproduction copy of contra hard-corps for the Sega Genesis, this reproduction plays on North American Sega Genesis models and retron consoles, gameplay in English, tested and works great, any other questions please ask, and enjoy! Sega Genesis. Sega Dreamcast. Super Nintendo. Playstation 3. Playstation 2. Nintendo NES. Nintendo DS. Nintendo 64. Contra: Hard Corps 1st Print (Sega Genesis, 1994) FACTORY SEALED & MINT! - RARE! One of the most iconic titles on the Genesis & an absolute must own for any serious Sega collector! You may not see another one like it! The shrink-wrap is glossy and smooth, very minimal to no surface wear. 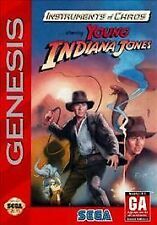 Young Indiana Jones (Sega Genesis, 1994) FACTORY SEALED! - RARE! A must own for any serious Sega collector! The shrink-wrap shows general surface wear including a few micro tears / nicked edges / exposed corners however noting large or notable (pictured below). The hang-tab is slightly exposed at the top as well. 3 out of 5 stars - Young Indiana Jones (Sega Genesis, 1994) FACTORY SEALED! - RARE! 5 product ratings5 product ratings - Young Indiana Jones (Sega Genesis, 1994) FACTORY SEALED! - RARE! 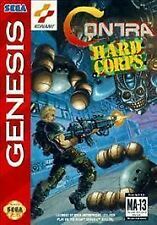 Contra Hard Corps - NM Condition - Complete - Genuine - Sega Genesis - Tested! Boxes will be original and anything other than light shelf wear will be disclosed. Sorry, we will not field requests on photos of these. However, due to changing market conditions our prices can and do fluctuate. I collected Mac, PC & console until 2000, then sold all 300. - The manuals, artwork and cases are in the best shape I could find them. - I never resurfaced them, however I cannot attest that they've never been resurfaced. For NTSC Sega systems and in an English version. Instruction - No. No Instruction, as photo shown. Well now you can. For NTSC Sega systems but in the Japanese version.